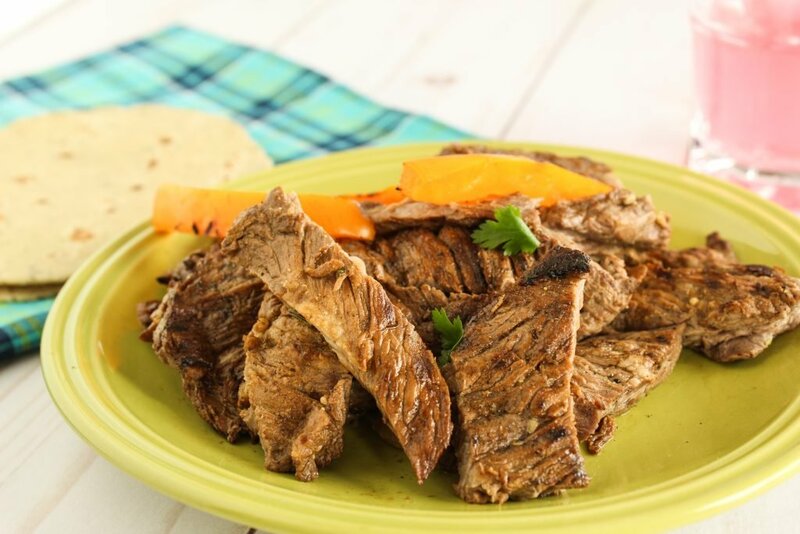 Easy garlic cilantro lime steak fajitas are a winning choice for an easy, delicious dinner. 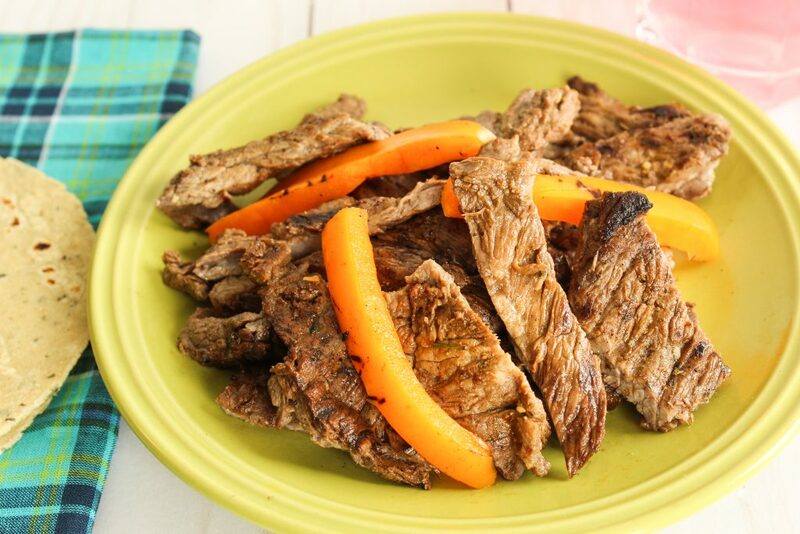 With little prep and minimal cook time, zesty fajitas can be on your table in a snap. 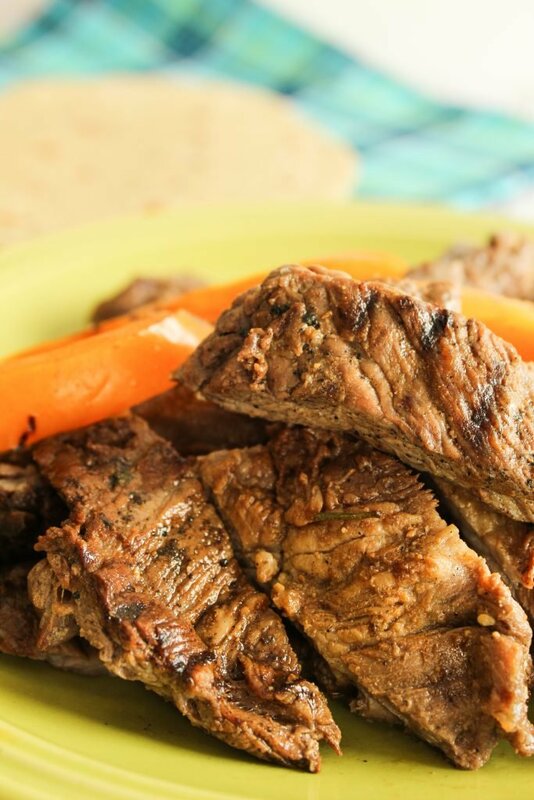 This quick fajita recipe gives you options, making it a versatile dinner to have in your rotation. I love making Mexican inspired dinners. Taco night is always a hit in our house. But sometimes, I’m just a little bored with basic tacos. I want something a little more exciting, but still as easy to put together as a taco night. 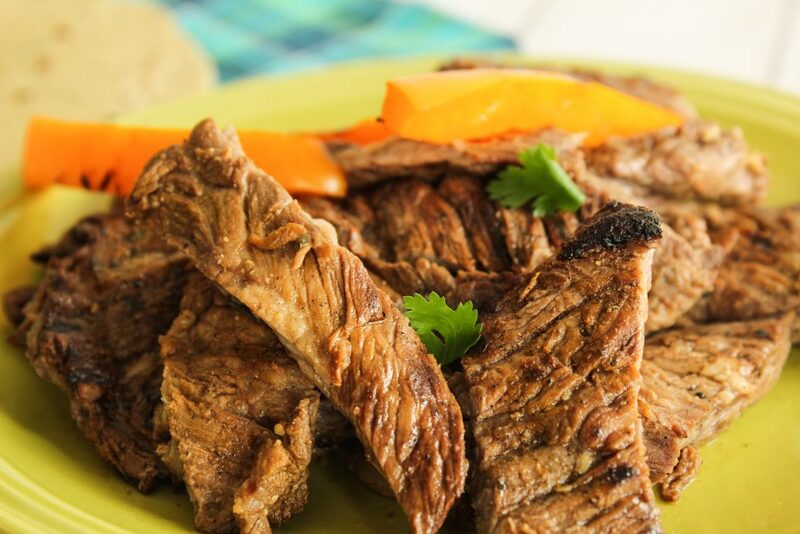 That’s where these easy garlic cilantro lime steak fajitas come in. They feel entirely different from a basic taco, but they are probably one of the easiest and quickest dinners I make. And they are easy and quick without sacrificing anything in terms of flavor. Plus they are the perfect meal to prep in the morning so all you have to do is throw the steak in a skillet or on a grill for a couple minutes before dinner time. 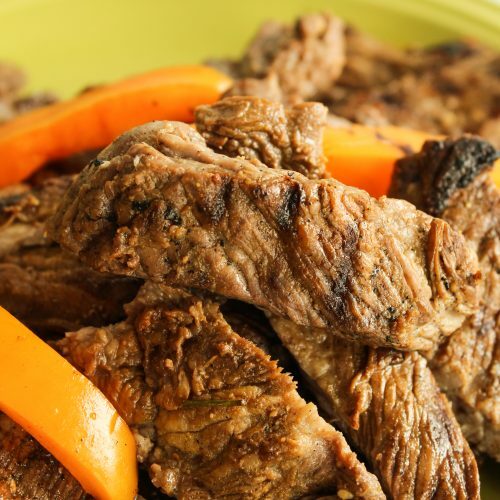 In fact, these garlic cilantro lime steak fajitas taste best if you do the prep ahead of time. And really, there’s not much prep to do so it would be easy to throw together in the morning before work or school or even the night before prior to going to bed. All you need to do is chop half an onion, mince or press some garlic and throw it into a large ziplocking bag with some sliced flank steak, lime juice, extra virgin olive oil, cilantro and cumin. Then you put it in the refrigerator while you go about your life and the marinade does its magic. And the results are seriously magical. The acid from the lime helps tenderize the steak. Plus the combination of flavors is just so good. You have some tart tang from the lime juice mixing with a little smokey flavor from the cumin. Plus there’s the freshness from the cilantro and a bit of bite from the garlic. It’s a combination of flavors that’s enticingly tasty without being too spicy for picky eaters. 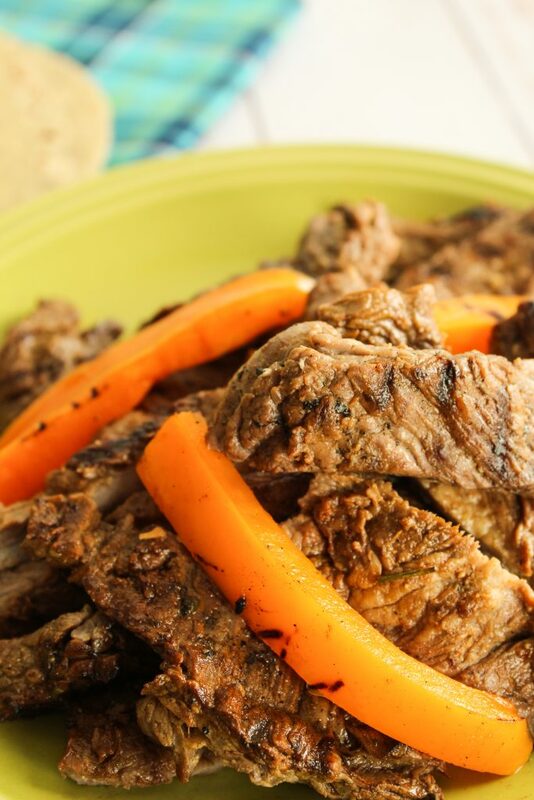 And not only are the easy garlic cilantro lime steak fajitas delicious but they take less than 10 minutes to cook. Plus they give you options. You can either cook them on a hot cast iron pan on the stove top. Or you can throw them on the grill and cook them outside for a nice outdoor dining option in the better weather. Once they are done cooking, serve them up on warm tortillas with any toppings you want. 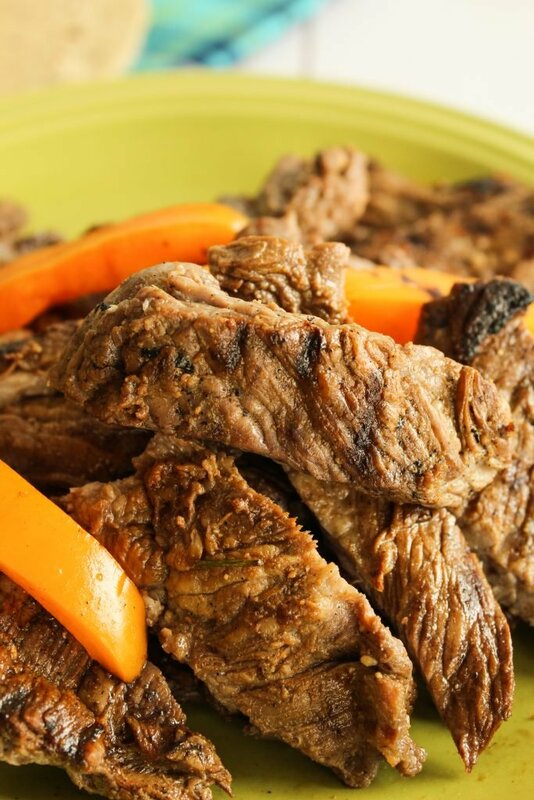 The whole family will enjoy these easy garlic cilantro lime steak fajitas. Combine all of the ingredients, except the pepper, in a large ziplocking bag. Seal tightly, releasing excess air. Smoosh and squeeze the contents around to evenly disperse the marinade. Refrigerate the meat mixture for at least 4 but up to 24 hours. You have two options here, cooking indoors or outdoors. If cooking indoors use a cast iron skillet, and outdoors cook the meat directly on the grill. Either way, shake off any bits of extra marinade before transferring the meat to a hot, medium high heat grilling surface. Cook 1-2 minutes per side, or until the meat's cooked through, but not dry. Remove the meat to a waiting plate, and continue until all the meat's finished. Serve the meat hot, with warm tortillas, and your choice of toppings. We like a variety of grilled onions & peppers, fresh diced tomatoes, sour cream, and garnishing with shredded cheese & freshly chopped cilantro leaves.